Thursday morning we left the house and drove several hours into the remote mountains of Southern California. 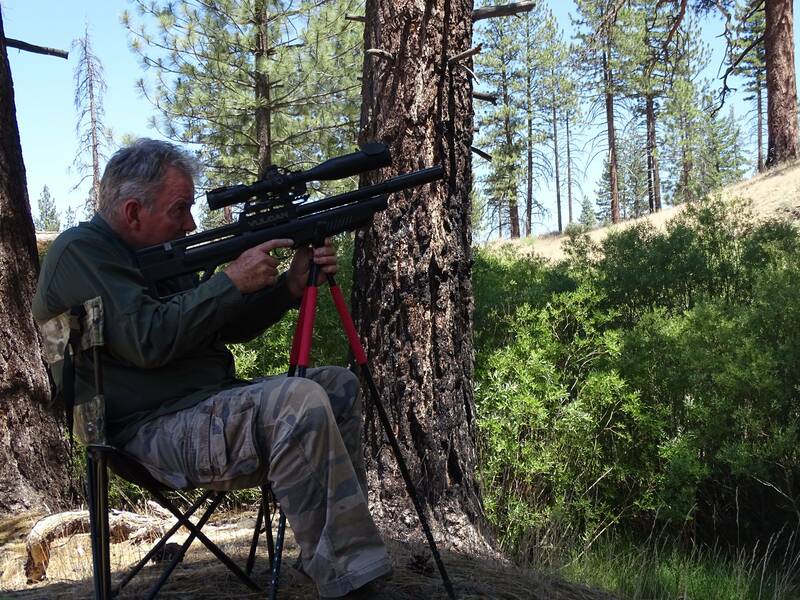 Terry and I set up in a location away from our campsite to check zero on our Air Rifles and to scout several new areas for hunting Ground Squirrels. The temperature was in the high 80’s so the new EZ-UP helped immensely in keeping us cool. Terry and I set up targets out to 100 yards and were happy to have zero wind that is a rarity in this part of the valley floor. 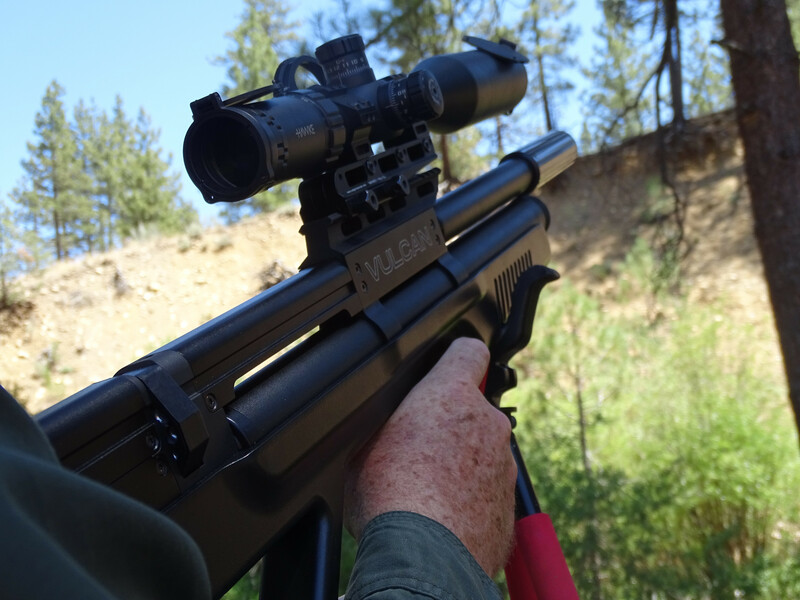 We had a great time shooting both the EVOL .30 and the .22 Tapian Mutant Bullpup, both amazingly accurate Air Rifles. After some practice with the rifles we packed up and headed down the road to a spot I had previously seen some Ground Squirrel activity. By this time it was the middle of the day and the temperature was rising into the 90’s making hiking around a bit unpleasant. 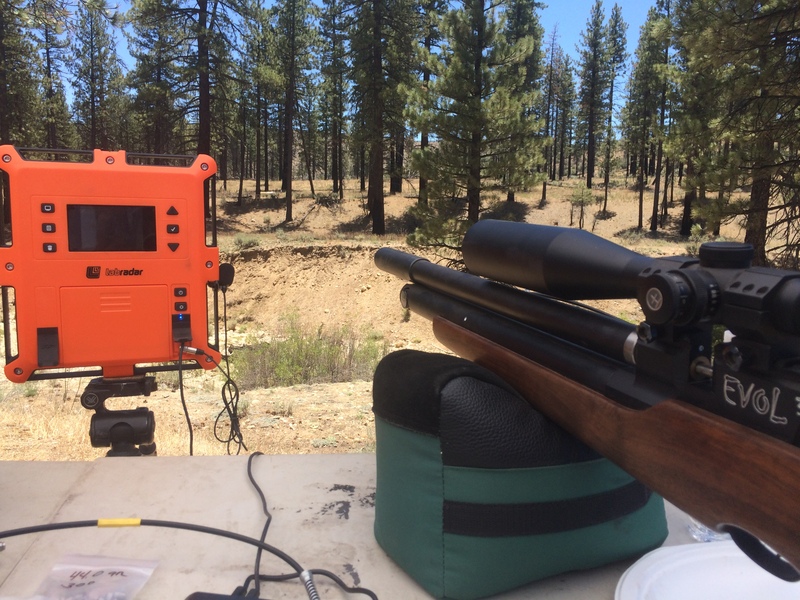 After about a half hour of looking for Ground Squirrels we packed the guns up and headed about another 14 miles into the mountains to around 5,300 ft elevation. 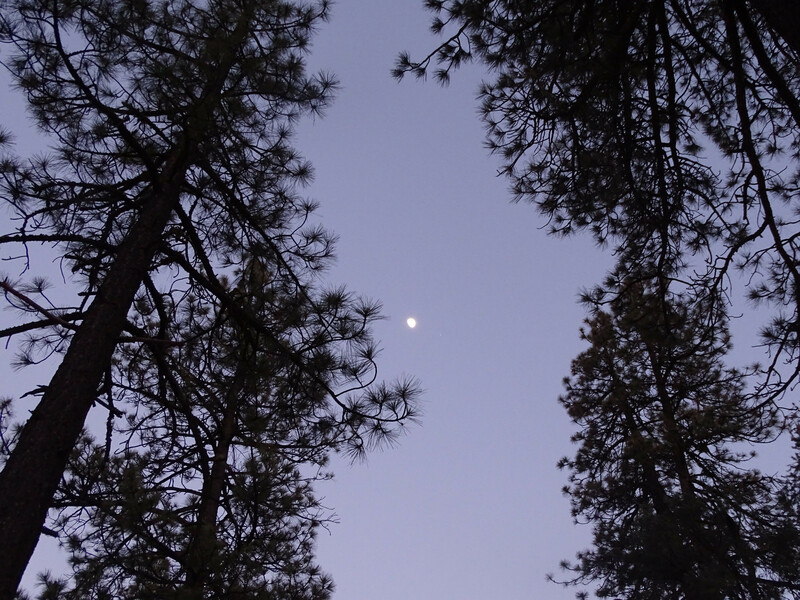 We had chosen this location as it would be cooler with many Ponderosa Pines that were nestled throughout the vast canyon. The area too had several creeks that are fed by natural springs where Marley could swim and play. I was quick to set up camp as well as the new EZ-Up canopy, that thing is an absolute necessity on trips like this. 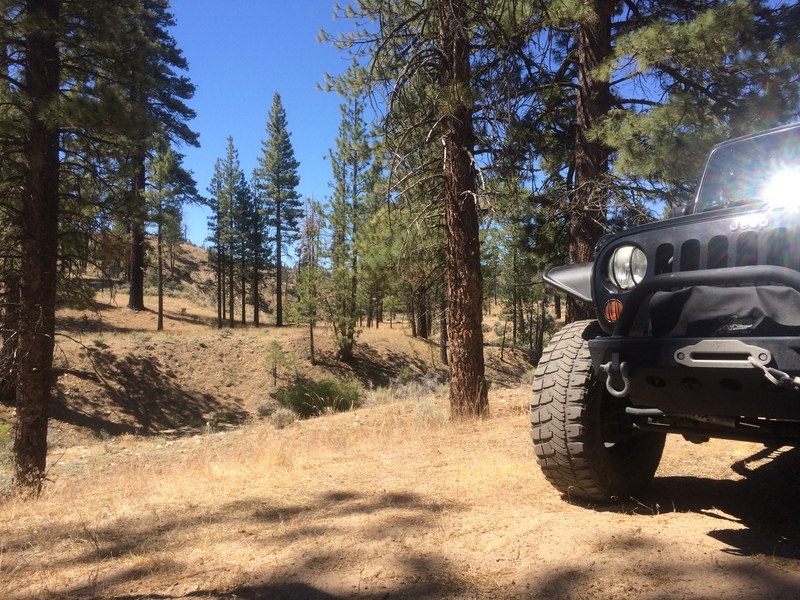 The Jeep was loaded with several coolers packed with water, ice and plenty of food for the several days in the wilderness. Ater setting up camp we set out down a nearby trail that followed the creek and gave some shade from the scorching Summer heat. The terrain was quite rugged and in some areas was near impossible to cross over the creek due to the steep embankments. I found an area overlooking the creek where I had spotted several Ground Squirrels moving from the many holes and fallen trees. I sat for awhile and spotted several Ground Squirrels going in and out of this hole, made a shot on one of them and missed. After making a poor shot i knew I would have to wait for a while before one would pop back out again. Within about 15 min one decided to show itself again where it was met with a 44gr JSB. I moved a bit further up the hill as I could hear the distant bark of several more Ground Squirrels moving about around the many fallen trees. I spotted one standing on a fallen log just down the hill overlooking the creeks embankment at 68 yards. The angle I had to shoot from was a bit awkward to work with as well as having to move my cameras tripod legs to keep upright. 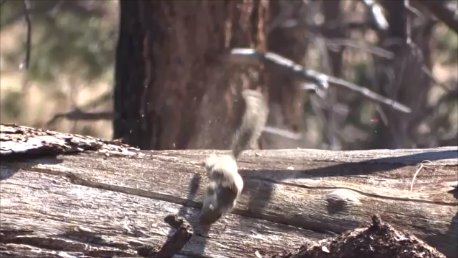 The shot was a bit low and made a gut shot sending the Ground Squirrel flying backwards. 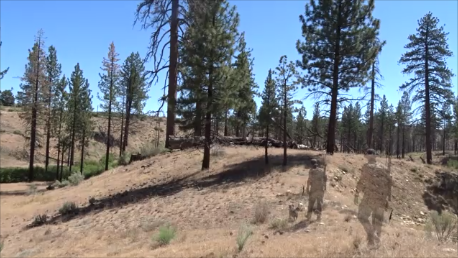 Almost immediately after I spotted another Ground Squirrel barking high up on a fallen log to my right at 83 yards. I took the shot on this one and hit just low sending a chunk of wood right into him, the heat was really getting to me and the sweat in my eyes was making it difficult to see well. I could hear Terry making several shots so went to meet up with him, together we hiked down next to the creek to try and get cool. Marley and I were perfectly happy staying down by the creek and not moving around much, we sat for awhile and spotted several Ground Squirrels moving around the embankments. We were able to connect with several of them although most were on the run. This was such a beautiful place to hunt despite the brutal Summer heat, was happy to just be able to get out and enjoy. Later that evening the plan was to try finding some Cottontail rabbits that may be moving about and to hopefully cook that evening. 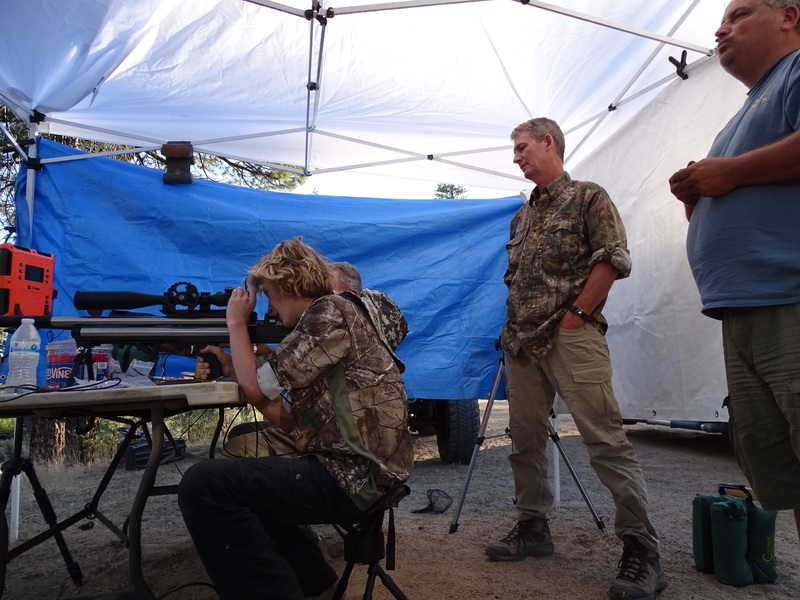 We made way back to the camp where we set up some targets along with a steel plate at 125 yards. 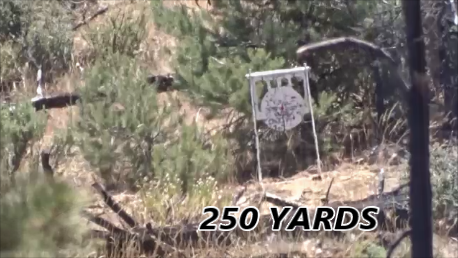 After dragging that heavy steel swing target out to 125 yards I took a break for awhile before shooting again. I watched Terry do some 100 yard practice before getting on it with the EVOL .30, the wind conditions were nice and predictable for late afternoon. After a few shots I was getting amazing groups with my gun at the shorter ranges and finally decided to move out to the 125 yard steel. I put 3 shots in a nice 1″1/2 cluster and think with better setup such as bags I could have done much better. Shooting like this really makes me appreciate how far modern PCP’s have come. Later that evening after we had rested a bit we took a walk around near the campsite searching for Cottontail rabbits. I had seen plenty of droppings as well as tracks but no movement at all, I think the heat has made them resort to coming out after sundown. After Marley and I took our stroll looking for bunnies we came back to camp and decided to cook up some chicken for an early dinner. The moon was near full that night and was thankfully much cooler making things much more bearable and relaxing. That next morning my plan was to wake up early before the sun came up although I slept so well that I didn’t awake till around 6:15am. Terry had already been gone when I woke up so Marley and I ventured away from camp about 3/4 of a mile to a big open field, perfect area to spot both Cottontails and Jackrabbits. I decided to hike up the barron hillside and work my way around looking for movement in the large open fields. 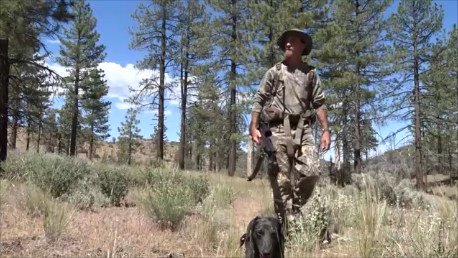 Hunting this type of terrain on flat ground is difficult and usually never works well without a shotgun. Marley and I spotted several Jackrabbits moving up the hillsides at some 200+ yards away but nothing within reasonable range for and Air Rifle. By this time it was apparent that the day was going to be another scorcher, already had my jacket off by 6:45. Marley and I picked a spot in the small amount of shade next to a bush and waited near 20 minutes before we spotted several large Jackrabbit moving in the field at close to 100 yards. I took a shoulder shot on one that sent it running up the hillside before collapsing, the second one was at 98 yards just next to a bush. The Jackrabbit gave me a nice side profile to line up for a perfect headshot that sent it into a flip. Marley ran to recover as it was wildly flipping all over causing a huge dust cloud. I went and recovered the first and met up with Marley where she had recovered the second large Jackrabbit. Marley and I were both happy our patience had paid off and were able to get two huge Jackrabbits within several seconds of one another. 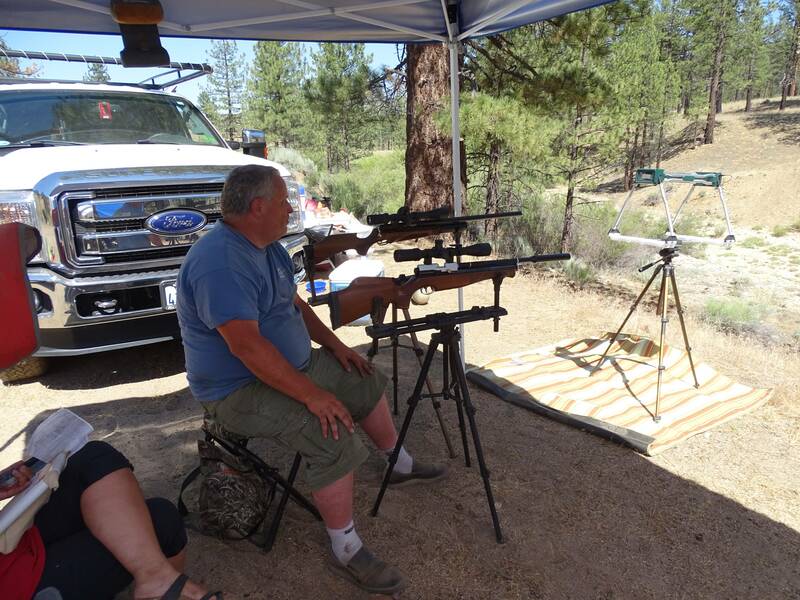 We took a break before throwing them into the pack and heading back to the campsite where Tom from American Air Arms would be showing up to spend the day. As marley and I hiked back we spotted several deer as well as many chipmunks moving about near the creekbed. 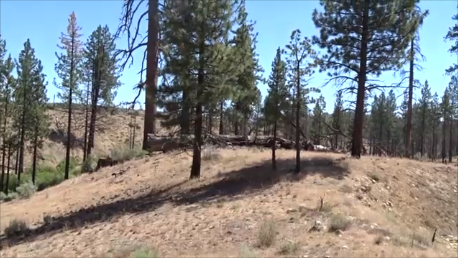 This area is loaded with larger animals such as Deer, Coyote, Bobcat, Mountain Lion as well as many types of birds. We made way back to camp where Tom had just arrived just in time for the heat to really become overbearing at 90 degrees by 8:30am. 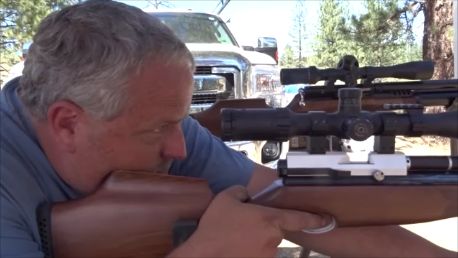 Tom had brought a new Air Rifle he has created that shoots a 27gr .22 slug putting out 60+fpe, he spent some time shooting that against a small 2″ spinner at 125 yards just under the steel plate. Enclosed is a previous photograph of the rifle, we will take a more in depth look at this very advanced Air Rifle in our next article. After our shooting session at camp we all headed back out to seek out some Ground Squirrel action, I headed East following the creek the other direction. Marley and I crossed to the other side of the creek and set up just under the shade of a large Pine tree. 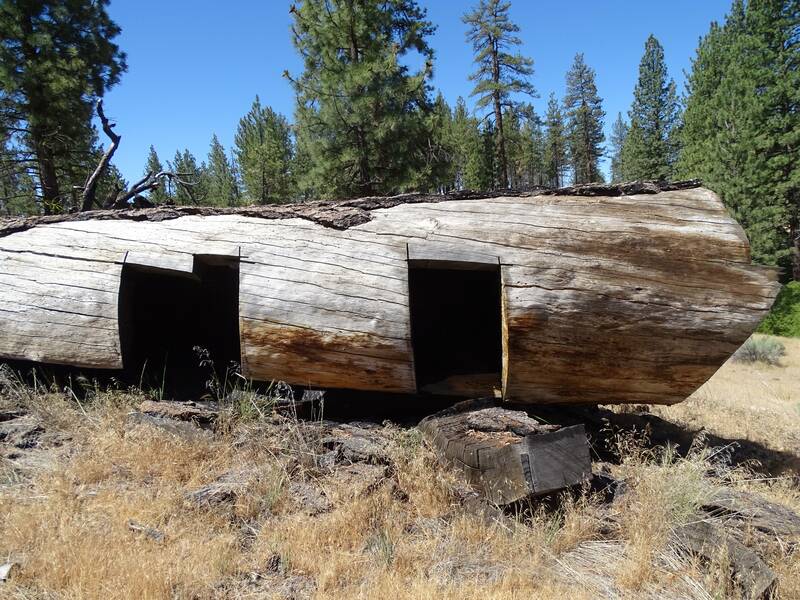 This looked to be a great location and offered a great unobstructed view in near all directions of the large area. To our right as well as in front of us were huge fallen trees that had Ground Squirrel holes all around them. I spotted several Chipmunks running back and forth from one tree to the next as well as the several periodic Ground Squirrel barks. I took a shot at several of the Chipmunks that were sitting on a root from one of the Pine trees next to the creek. These shots were all around 30 yards, close range shots that required some hold-under for once. 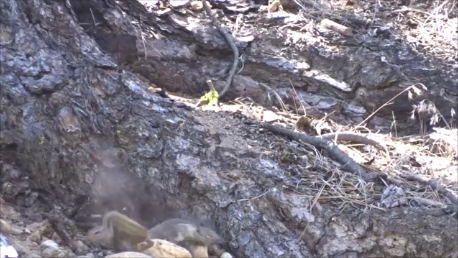 After a few minutes I spotted a fairly large Ground Squirrel sticking it’s head up from behind a log at 115 yards. I made the shot a bit high and it came down right on the back of his head drilling him right into the ground behind the fallen tree. This area looked to have a large population but I think the heat had kept most of them in the Ground as it was well up to 100 degrees out. I can’t stress enough how important it is to carry a large amount of water, more than you think you need. This environment dehydrates you so quickly that heat exhaustion can happen very easily. When we are out in the wilderness like this, nobody will find you and when they do you just may be dead. With Marley I have to be especially careful about making sure she has enough water as well as keeping my eyes open for Rattlesnakes. Having her bit by a venomous snake is one of my worst nightmares, miles from any type of help. After sitting for about 20 more minutes with no action we looped around back towards camp following the other side of the creek. 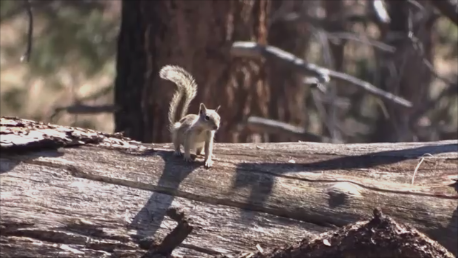 As we moved through the tall Ponderosa Pines I could see a Ground Squirrel in the distance moving about on a huge fallen tree. I set up the camera the best I could and tried to follow it with the lens while trying to set up the range and gun at the same time, very frustrating. The Ground Squirrel was at 68 yards but moving further up this fallen log. I made the shot that finally ended at 73 yards sending the 44gr JSB right into his back sending up a cloud of dust as it smacked. The past two days were a great time spent with friends but the heat made moving around quite miserable. Marley and I continued back to camp where it by this time was around 12:30pm, we packed the Jeep and waited for Tom to get back before heading out. This was a slow few days of hunting but was very happy with how well it turned out considering how hot it was. As I’m writing this we are already planning for the next trip, can’t wait to share. Enclosed is the video of our adventures, hope you enjoy and will help us by subscribing. 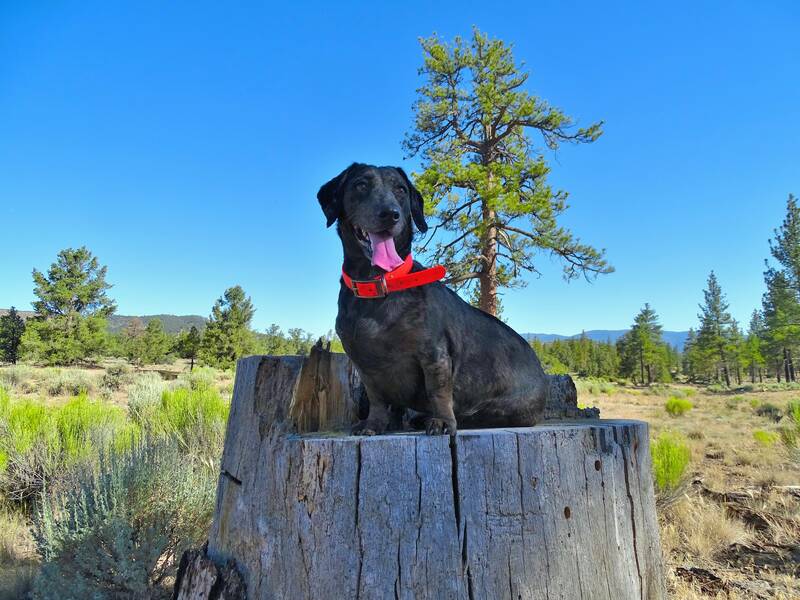 Late Thursday evening I headed out with Marley several hours North into the secluded NF where I had previously scouted a good area to not only hunt, but shoot. 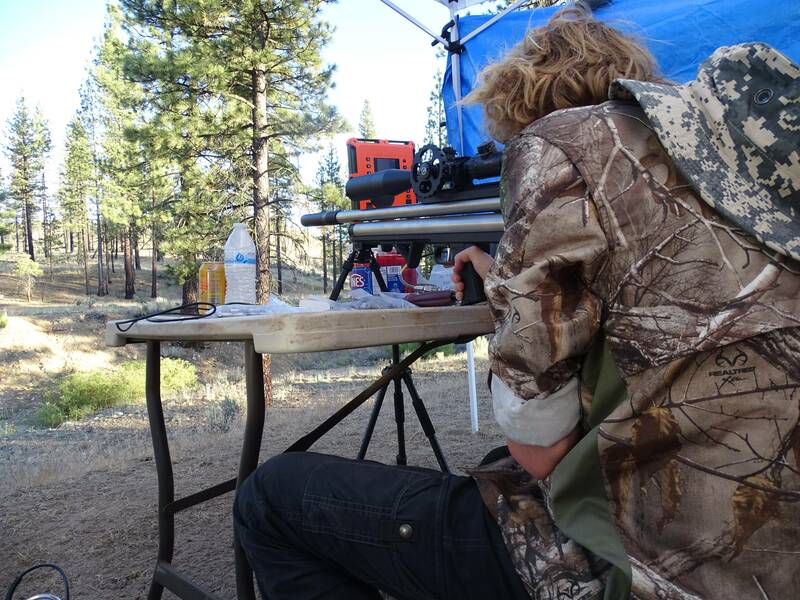 My goal was to spend several days hunting and testing some ammo for not only the EVOL .30 but the .308 and .357 Slayers. After arriving close to dark I found a good place where I was meeting my friend Brent and his 20 year old son who were shortly behind me. After a short wait they had arrived and started making camp in our usual fashion along with a nice campfire to take the chill off our bones through the night. After a short hike across a creek and up a steep ravine Marley and I decided to take a break in the shade as it was getting fairly hot, we could hear the many birds such as Woodpeckers and Blue jays staying very active. 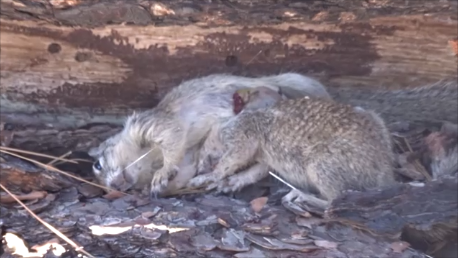 After several minutes I was able to spot several ground squirrels moving about across a huge fallen tree. I shot at several coming within inches, even close enough to blow one off the log with the shrapnel of splinters from the impact of the 44gr Polymag. 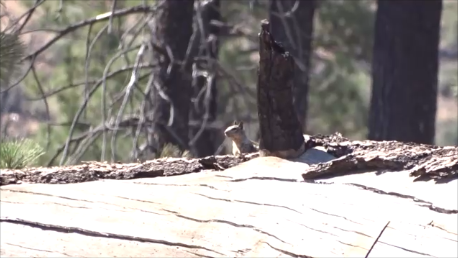 After making some wind adjustments I spotted a good size Ground Squirrel poking his head up from behind the fallen log and just to the left of a small nubby branch. When the wind had that moment of calmness I was able to make a beautiful 130 yard head-shot that blew that squirrel right off his rocker. 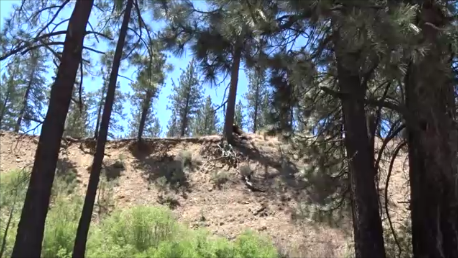 It always amazes me how far a shot really is when I have to walk it, was not easy making our way down the steep embankment and up the other side where we made our way to the giant fallen tree. The tree was massive and for some odd reason had what looked to be several doors someone had cut into it.?? Marley and I made our way around the other side and saw several more Ground Squirrel scrambling away through the broken mess of branches. We headed up from the other side and hiked up a hill where we sat in the shade at 90 yards looking down. After about 10 minutes of patiently waiting Marley and I spotted several more Ground Squirrels moving about, one even stopped right on top. The 90 yard shot was fairly easy for the .30 monster I was using so I was able to plug him pretty good as he made his way down off the log. Marley and I made our way down to document our kills and to move to another spot where we would make way back to the tuck. We continued down into the ravine and followed the creek back towards the Jeep when I spotted several more Ground Squirrels running up a steep embankment. The Ground Squirrels seemed to all be invading a large tree that had roots that were protruding the ground from erosion. I sat in the shade while Marley played in the creek, trying to cool off from the Summer heat. I was having a difficult time positioning myself for a shot as the area was very off camber and too was forcing me to shoot near vertically. 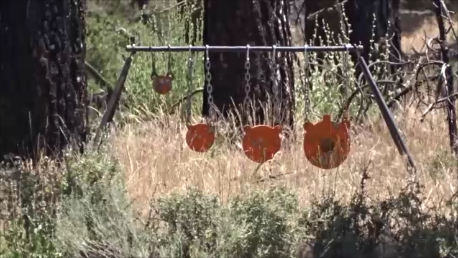 I finally spotted several and ended up killing the larger one on the right offering a bit larger target at 45 yards. Marley and I headed a short distance back to the Jeep where we were soon met by Nick and his family. 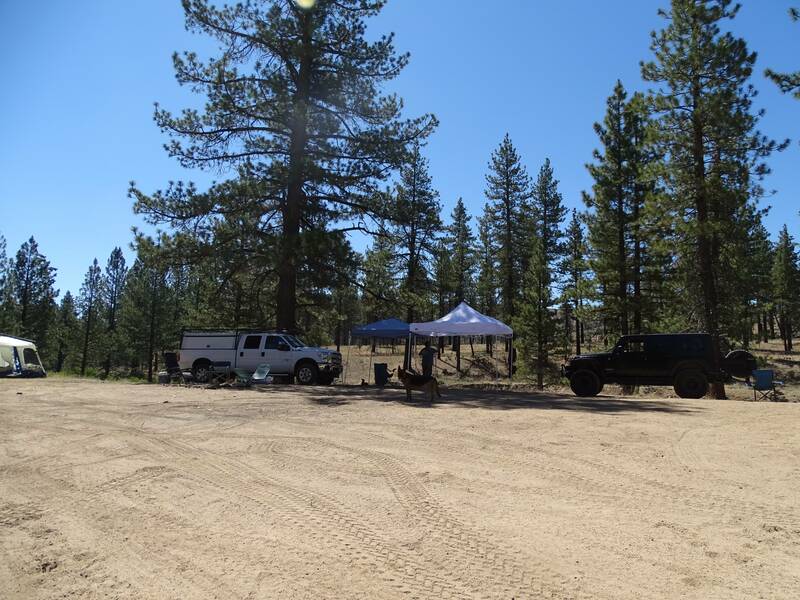 We set up a nice camp along with some EZups that would take the sun off and too offered a cool place for a shooting lane. We set up several targets, spinners and later on my two friends even brought some heavy steel we set up at 130 yards through the trees. After a full day of shooting we had a nice campfire followed by dinner, laughs and a few mosquito bites. The night was so peaceful and quiet other than a few Owls and the distant chatter of Coyotes. Saturday morning came about and I woke up a bit late, being now after 8:00 am where we had expected Tom and several others to arrive throughout the day. Nicks wife was kind enough to make a nice pot of caffeine that I much needed to start my day of adventuring. Marley was so happy just to be outside and able to play stick with Nicks two boys. 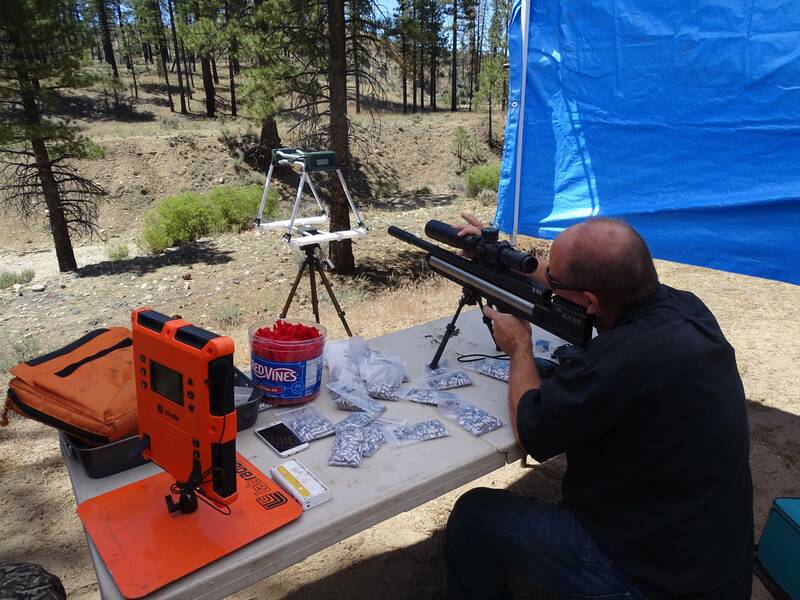 Sometime around 11:00am Tom arrived with a .308 and .357 Slayer where him and Nick planned to test several different weights of Big Bore ammo. We had acquired a heavy steel quadrant target that I dragged 250 yards up through the trees, a great challenging target considering the small window it left to shoot through the thick branches. Tom was using the nielsenspecialtyammo.com swaged 98.9gr .308 going 970 fps, gets out pretty quick and by the end of the day proved to be very accurate. Later after lunch my friend Brent and his son Brian came to visit us and to tell us about the scouting they had done for Cottontail. My friend Brent is not an Airgunner but him and his son both showed great interest in the Big Bores we had on the table, heck who wouldn’t? Tom eagerly invited them to try them out and they both surly did. After a bit more fun we took a break and relaxed in the shade talking about hunting, shooting and just having a few great conversations! 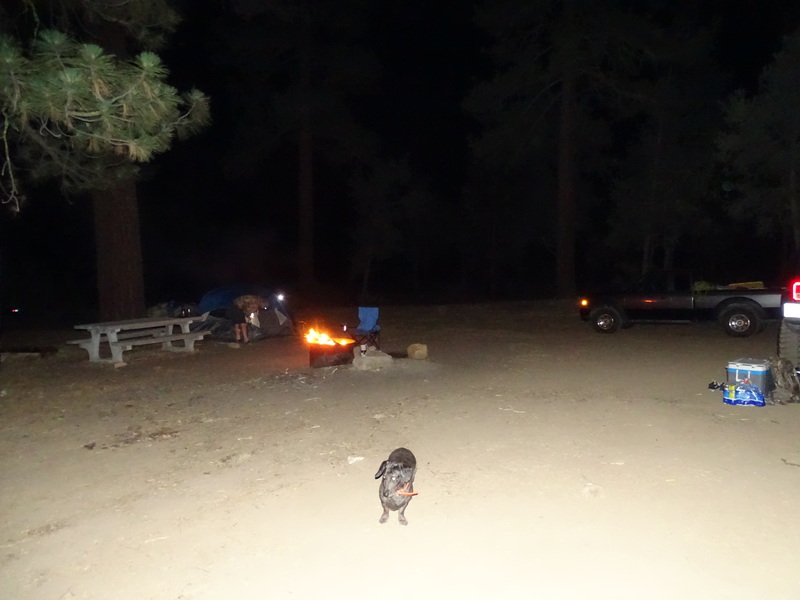 Tom sadly had to leave the fun and head back to his desert home so Nick, Marley and I loaded into the Jeep to do some scouting and to meet Craig down the road where he would follow us back to camp. By this time it was near 5:30 when we finally met up with Craig, was happy to see another friendly face join us in the reindeer games. Marley and I went out on another short hunt not far from camp where she was able to tackle herself some dinner down near the creek, a small Cottontail to be exact. That little dog is as amazing as they come and has brought so much joy into my life having such a good little companion as her. That evening we had more laughter along with some tasty chicken cabobs Nicks wife provided. The next morning I woke up fairly early and headed up the hill to visit Brent and his son Brian and see how they faired with the opening day of cottontail season. 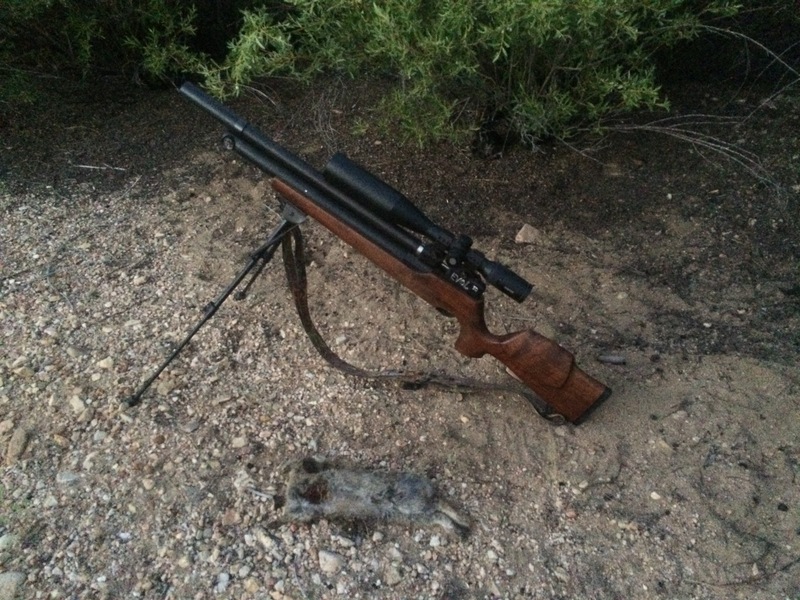 They ended up getting one Cottontail not far from our camp using a shotgun at 30 yards on the run. I wish I had taken my camera but unfortunately did not. We all made way back to camp and enjoyed the shade from the EZup along with plenty of water that is so important on such hot days, especially when hiking around. 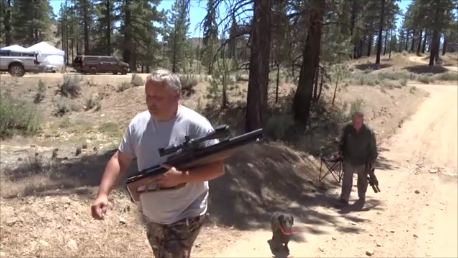 I had suggested going on a Ground Squirrel hunt and Nick and Craig were both eager to attend. We packed our gear and brought plenty of water where I had planned to set them up near where I had gone the day before. I set them both up about 50 yards apart where they both had some good view of the adjacent hillside. 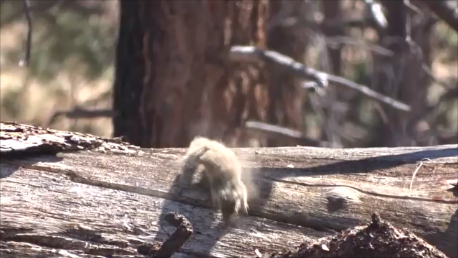 After several minutes Craig and I could hear the solid crack of Nicks .25 Cricket smacking a Ground-squirrel as it made its way up a fallen log. Nice shot at what looked to be about 35 yards or so. I sat with Craig for about 20 minutes before Marley and I decided to take a hike and circle back around to camp, I had hoped to find more active areas but the heat was taking its toll on us both. Craig had left not to long before Marley and I arrived back at camp, was hoping everyone would have better luck with hunting but it really was very hot. That evening Nick and I set out again where his son was able to spot a good size Cottontail at 35 yards sitting under a bush, hidden very well I might add. Nick took a great shot that put that bunny down with authority. Marley was happy to retrieve and was even allowed in the photograph. 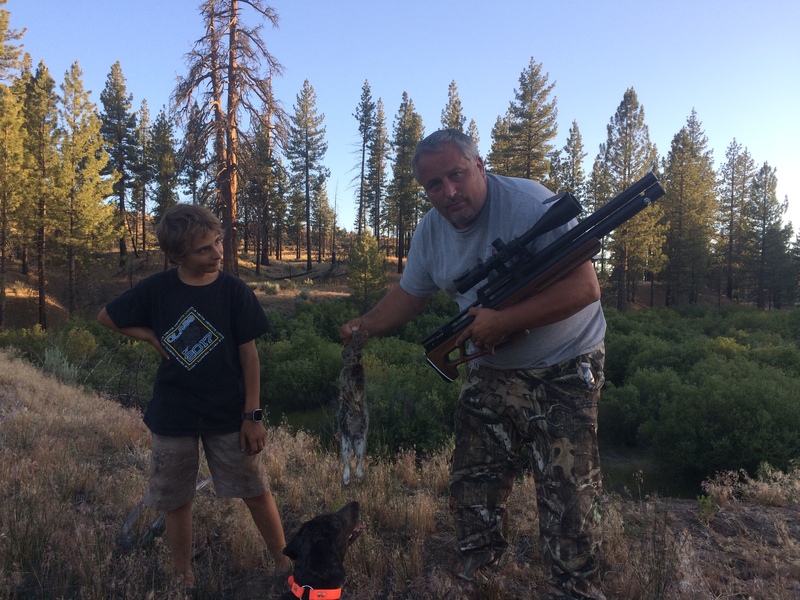 Nick and his boy headed back to camp and Marley and I continued along the creek-bed when just before dark I was able to spot a small Cottontail at 45 yards just at the edge of the embankment. Marley and I had a great finish to a long weekend and were both super tired, we slept great that night. The following morning we got up a bit late and started packing up the camp for our long venture home, where we both needed a long hot shower. I thank everyone who attended and am embarrassed because I forgot some names and was not as organized as I usually am with photos. I have been doing a great deal of filming lately and have not been writing as much as I should, this is what I enjoy and can’t forget the importance of it. Through my writing I hope to not only entertain but to bring the spark of our sport to the newcomers. As some may know I started this online magazine along with my video series that can be found on YouTube, I have put much work into both and really appreciate all the support I have been given. Check our video page for more action and please subscribe!